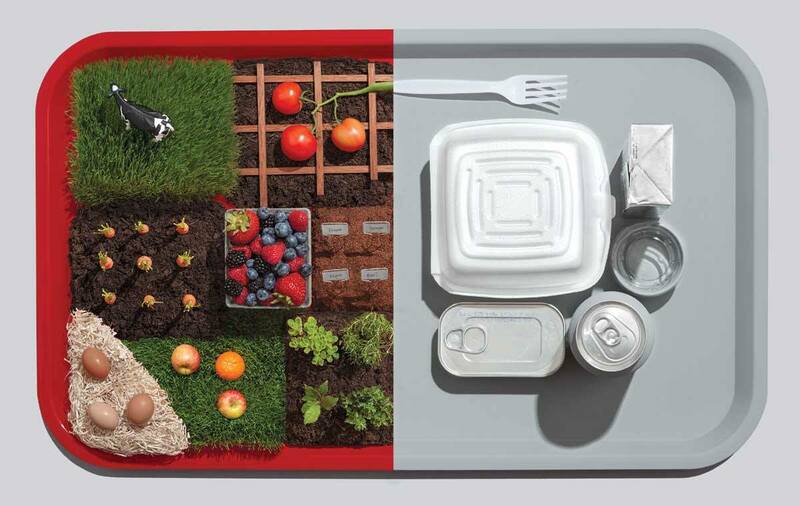 Why farm-fresh food rarely reaches our kids' trays. Five days a week, weather permitting, the students at Reed Elementary, in Tiburon, California, sit down to lunch at picnic tables in a courtyard abutting the public school’s athletic fields. On the menu: roast chicken with organic potatoes and local zucchini, gluten-free pasta with fresh pesto sauce, and pesticide-free peaches, apples, and nectarines – all served on compostable dishware. Would that all our kids had it so good. Unlike at Reed, however, where the parents kick in $6 a day for meals, most American public schools rely on the National School Lunch Program. In 2014, it provided five billion lunches to 30 million children. The federal government shelled out $11.6 billion to make that happen. Feeding our children, in other words, is big business. 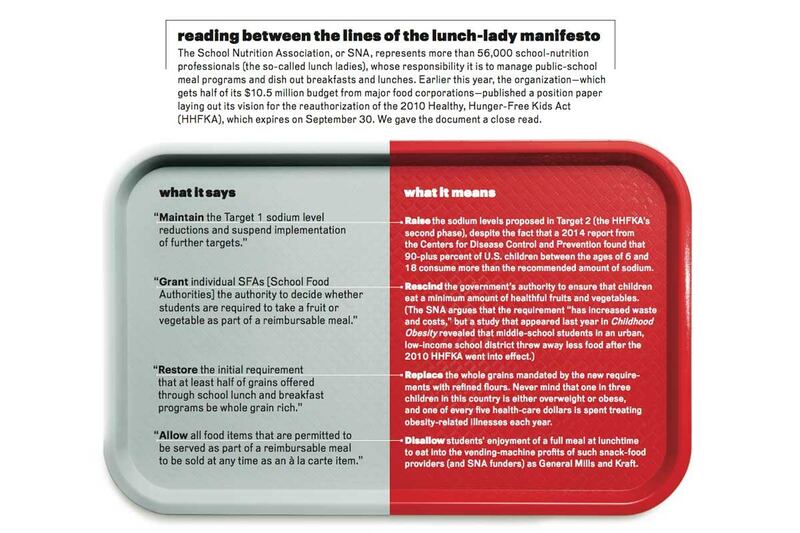 And while food crusaders like First Lady Michelle Obama and the Edible Schoolyard’s Alice Waters may have one agenda, the major corporations vying to get their products onto cafeteria trays have altogether different interests. Factor in the political sway of the multibillion-dollar food industry (and of the dairy, corn, poultry, and other lobbies with which it works), and you begin to understand just how complicated the simple act of nourishing students has become. Two corporations make big bucks feeding schoolkids mediocre food - but one gives outsourcing a good name. Roughly 15 percent of districts in the National School Lunch Program outsource their operations to for-profit vendors. But the multinationals that dominate the field (and also serve hospitals and prisons) tend to be better known for legal troubles than lasagnas. Two such companies were sued for mismanaging funds: Sodexo was ordered to pay the New York City school system $20 million in 2010; Chartwells, a subsidiary of the Compass Group, wrote a $19.4 million check to the Washington, D.C., system earlier this year. Oakland-based Revolution Foods, founded by Kristin Groos Richmond and Kirsten Saenz Tobey, offers a more benevolent model. Its school lunches, prepared daily at a network of culinary centers, are free of hormones, high-fructose corn syrup, and artificial flavorings. By partnering with suppliers that offer discounts on raw ingredients, the nine-year-old company is able to keep meal costs just pennies above the $2.93 per tray paid by the government. Clearly Richmond and Tobey are doing something right: Today Revolution Foods is an $80 million company, delivering more than one million meals a week to 200,000 students across the country…and not a lawsuit in sight. At the same time, the prevailing health issue in this country has shifted from hunger to obesity. Since the 2010 reauthorization of the Child Nutrition Act, known as the Healthy, Hunger-Free Kids Act (HHFKA), lunches, breakfasts, and snacks sold on school grounds have fewer calories; contain less salt, sugar, fat, and white flour; and include more fruits and vegetables. The HHFKA, which draws on recommendations from the nonprofit Institute of Medicine, will become even more ambitious over the next seven years. “I am deeply unsympathetic to their argument,” says Marion Nestle, a professor of nutrition, public health, and food studies at New York University. The SNA’s requests for more salt and less whole wheat, she argues, open the door to better-tasting processed foods, which translates into bigger revenues for the supporters of the SNA. Fully half of the organization’s $10.5 million budget comes from Big Food, including such companies as General Mills, Domino’s, and Tyson. (General Mills has also donated $80,000 to Congressman Kline’s war chest since his first run for the House in 2003.) Overall, agribusiness gave more than $48 million to Republicans and more than $16 million to Democrats in the last election cycle. Sodexo alone spent more than $1.1 million lobbying Congress in 2010, much of it related to the HHFKA. In addition to new dietary standards, the 2010 act introduced the $5 million Farm to School program, which came with three mandates: to make grants that support farm-to-school programs (thereby enabling districts to swap out those boxes of processed goods in favor of local fruits, vegetables, and meats); to encourage school gardens; and to support nutrition education. No one pretends that achieving a wholesale cultural shift will be easy. “The school service people are up against horrendous financial and sometimes physical barriers,” says Nestle. 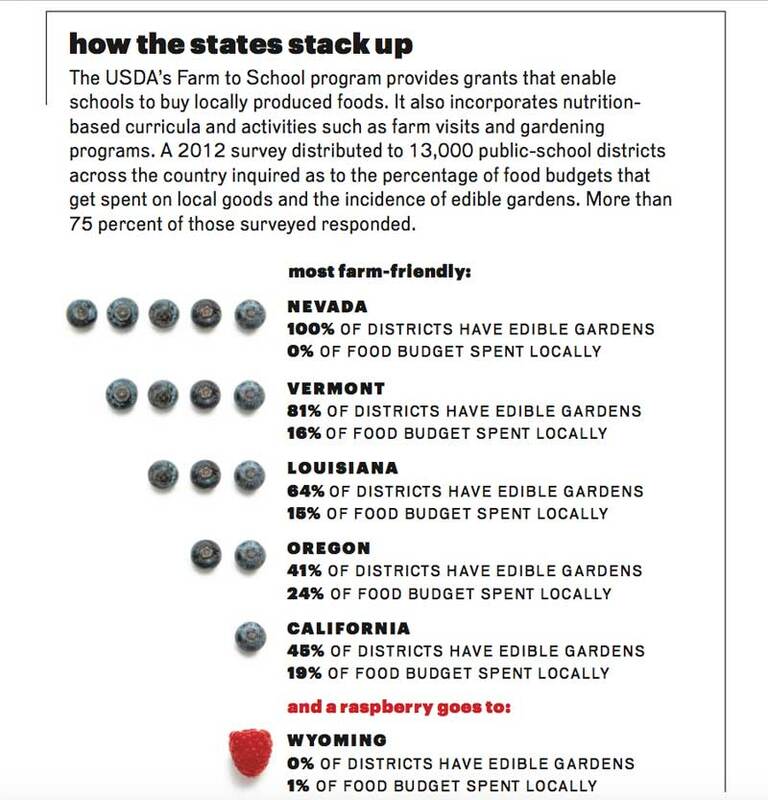 “The money issues are real.” (The National Farm to School Network is sponsoring a request for an additional $10 million for the USDA’s Farm to School grant program, and while the bill has bipartisan support in House and Senate committees, few expect it will receive that amount.) Finding farmers to grow all those watermelons, berries, and leafy greens takes effort, as does learning to store and cook them for thousands of students. But none of it is impossible. While the decision-makers in Washington hash out the details of the HHFKA reauthorization, school officials at the district and local levels already are taking matters into their own hands. In the city of Oakland, for example, voters recently approved millions of dollars in a ballot initiative to construct a central kitchen and establish a learning garden for the district. Both will open in 2017.